← Meme! That’s all you ever think about. Poker-faced Canadians, are they America’s biggest threat? They started airing The Daily Show over here in the U.K., oh, it must have been a couple of years ago. We’re a day behind of the original broadcast, of course, but I’m so pleased that I get to catch it at all. The Daily Show, with its shrewd satire, is one of the best ways to keep up on American politics. Yes, I understand what a sad statement on our news media that is. But, the happy truth is, whatever I’m missing from back home–well, I needn’t worry. The Daily Show is bound to make fun of it in a timely fashion. Like any timeworn program, the quality can waver sometimes, but, The Daily Show is pretty reliable all things considered. The Toronto native but current Hell’s Kitchen NYC resident, lists Betty White as one of her favorite comedians. I think that choice alone gives me, a slightly obsessed fan from a safe and respectful distance, a huge insight into why I like Samantha Bee so much. It’s all about seeming to be one thing and actually being another. Samatha Bee is one of the best faux-journos on the show precisely because she appears to be a nice and normal lady who is going to ask you (the interviewed) some simple questions for a few minutes. You rest easy, thinking that the whole formality of it all will be relatively painless. Then, she opens her mouth and the fun begins. Here’s one of my favorite Samantha Bee stories. I think it may be from 2005. She went down to Florida to interview a conservative candidate running for state rep. Have a look. What’s amazing is how straight-faced the correspondents on The Daily Show can remain when faced with such buffoonery. She maintains that, because it’s never funny in the moment, it’s easier than it looks. I suppose there must be some truth in that. If she’s really in character and treating it like a serious interview, then she can’t, simultaneously, be audience to the insanity that is occurring. You can’t be a viewer and a participant at the same time, in other words. I read up a bit about this particular interview and she cops to this being one occasion where she actually did a spit-take that had to be edited out. It was when Heeney coined the term “Homonausic”. Highly impressive though, that she could sit still and carry on after hearing the word ‘intenuendes’ come out of his mouth. I sweat her technique. Prior to finding fame in America, she was, actually, pretty unfamous in Canada as well. She was just a regular struggling actress who waited tables and tried to create her own opportunities like performing with all-girl sketch troupe, The Atomic Fireballs, and playing the title role in a Canadian live action production of Sailor Moon, which, unfortunately, I could find no pics of. 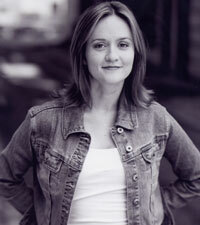 Before being head-hunted for The Daily Show, she also waited tables. Here’s another fantastic clip from the show, wherein Samantha speaks to some fellow Canadians who are interested in emigrating to America. I can’t imagine the fireworks that must have been exploding in her head when that lady leaned in to ask Bee if she might confide in her a secret that she had been harboring. Only comedy treasure can lie at the end of a statement like that. Bee is married to fellow Canadian and Daily Show correspondent Jason Jones. Jeez, the influx of funny Canadians is truly impressive. One more Mike Meyers or Jim Carrey and they are officially the Mexicans of our performing arts industry. They took our jobs! They lead, from what I can tell from my creepy Internet based research a normalish life with two young kids and a dog and cat. 1.Pezzettino and Frederick by Leo Lionni (Random House) is graphically beautiful and I love the themes. 2.The Giving Tree, written and illustrated by Shel Silverstein (HarperCollins) is impossible to get through without crying. 3.Chowder, written and illustrated by Peter Brown (HarperCollins) is about a bulldog who thinks he is human. My 17-month-old daughter is at the age where she loves anything dog themed. 4.Dr. Seuss books (Random House) are just great! 5. Alligator Pie, written by Dennis Lee and illustrated by Frank Newfeld (Key Porter) is not available in the States. We had to order this Canadian classic direct from the source. I haven’t heard of a few of these. But, Christmas shopping for my nieces just got a whole lot easier. Does it make me a bad person to admit that I’m the one that really wants to read them? I’m only bad if I crease the spines before sending them on, right? I am a Canadian living here in the UK and can I truly say that yes we are funny. 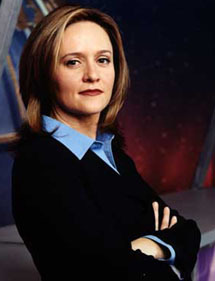 I’ve had a crush on Samantha Bee for a long time. I had the pleasure of being waited on by SB and she split soda on my favourite hockey shirt – but she was so cute I didn’t get mad. Thanks for this funny post. I look forward to many more.